Happy birthday Singapore! It's been a while since i'm celebrating it from our sunny island and a first from our new home. Looking forward to the fireworks from our terrace later! :) Now if only i can get Chef Jeremmy Chiam's supper special at Le Binchotan delivered to my place, that would be perfect celebration! 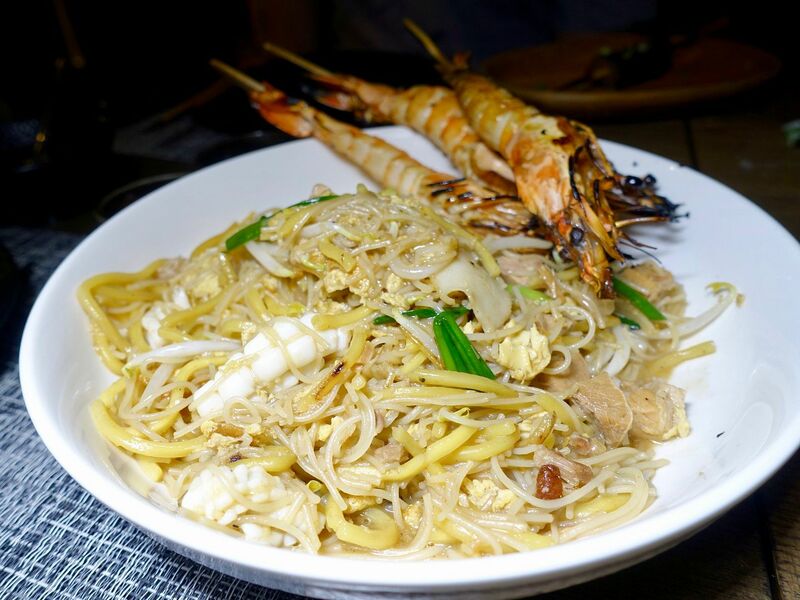 From now till end August, dig into some specials at this French-Japanese restaurant, like this elevated local Hokkien Mee ($17). The broth is based off the stock for French seafood bisques, which is even more painstaking to cook than our local version. At least 2kg of fresh prawns, 2kg of prawn shells, and 2kg of lobster shells are roasted together with mirepoix, then sauteed over high heat with a dash of tomato paste. This is then simmered with water, bacon, dried japanese scallop, soy bean and pork belly for at least 10hrs. The resulting broth is then used to cook yellow wheat noodles and white rice vermicelli. 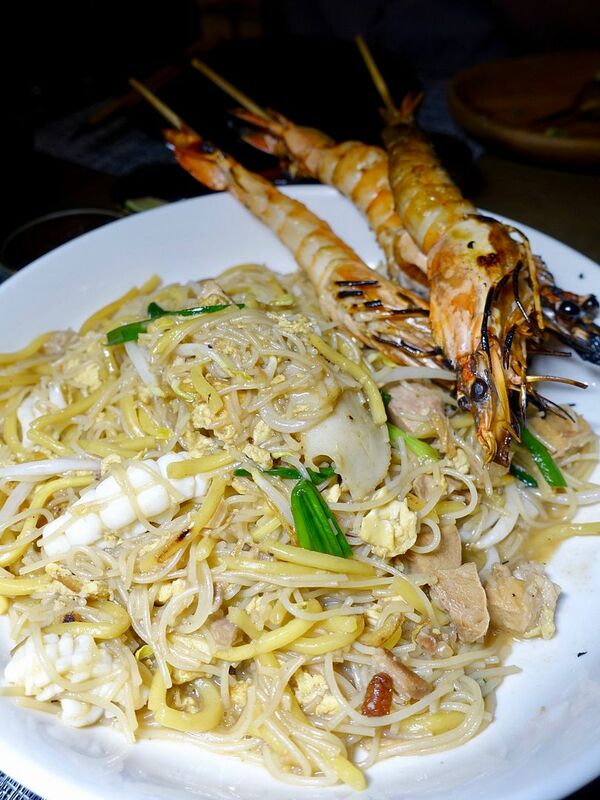 And of my.. the flavors.. May i say its the best Hokkien mee in town? Oh and not just that, it's served with 3 juicy tiger prawns grilled over the binchotan. 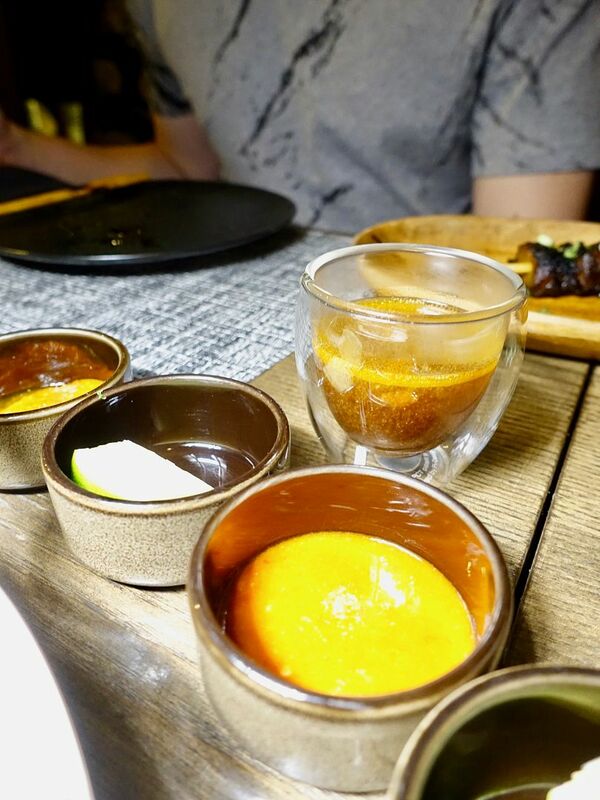 Plus, it also comes with a carafe of the same broth that's used to cook the Hokkien Mee. I kept telling Jeremmy that he needs to make a soup version of this because woah that broth! And also, if you like it hot, the fiery sambal belachan made in-house MUST be added to is a must! The hokkien mee is good but the special satay is great too! 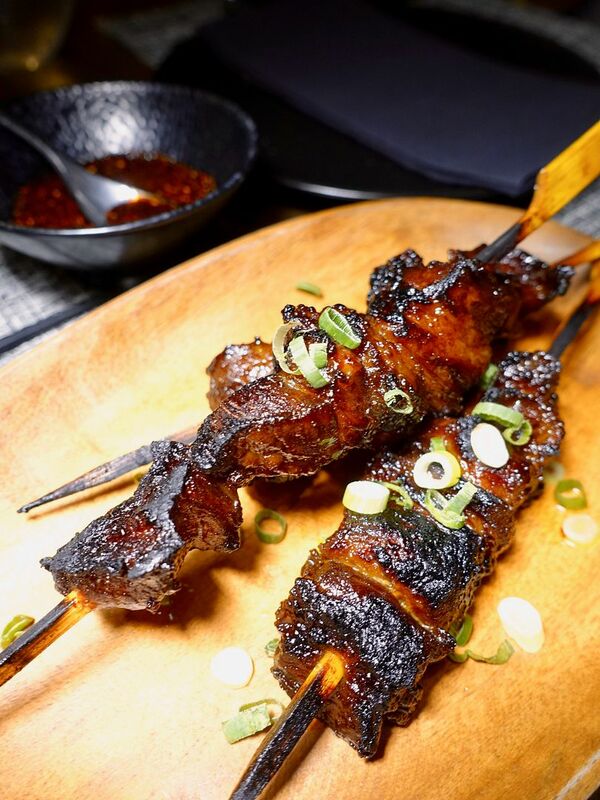 These skewers of springy Iberico Pork Collar ($17 for 3 sticks) are inspired by our local satay. 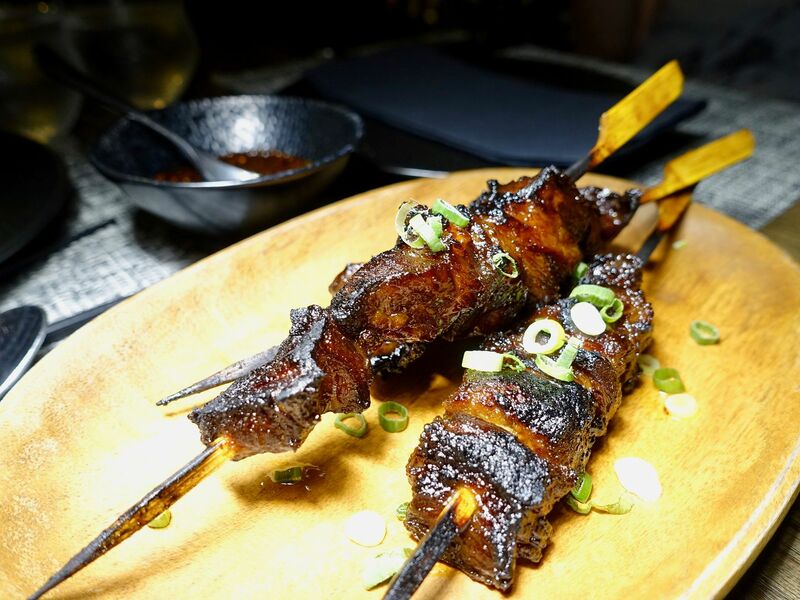 Marinated with an unexpected mix of sauces, herbs and spices including gula melaka, garlic, lime, nutmeg and satay’s mainstay of turmeric, the skewers of bite- sized pork are grilled over binchotan while being basted with rich French butter, and brushed with kicap manis. This is almost char siew-like actually. I loved the sweetness in this one and kept dipping the meat into the kicap manis sauce which is infused with shishito, banana shallots and togarashi. There has to be a local drink to go with supper for sure! 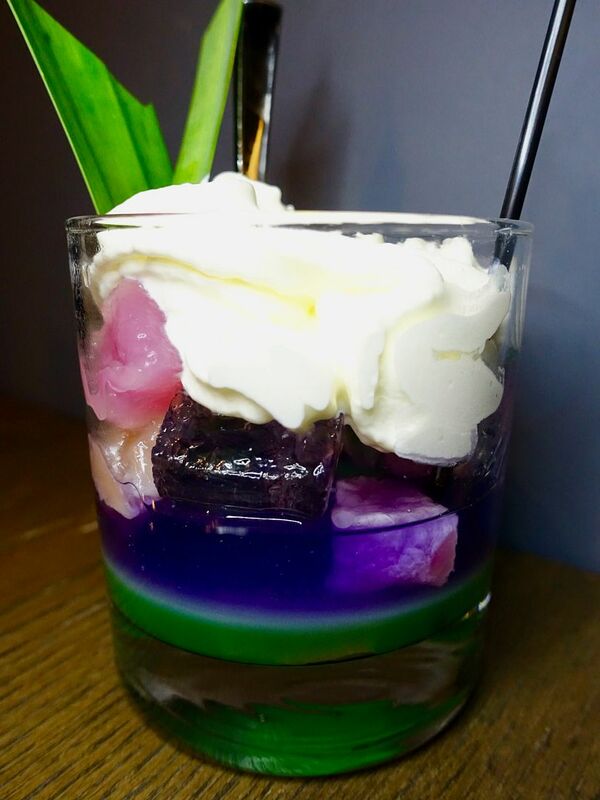 Check out the colorful Bubur Chacha ($16) which is made from a taro-infused vodka, added to a concoction of coconut and pandan, and chewy housemade tapioca jelly chunks. It's really more of a dessert than a cocktail but it definitely works if you enjoy a rich coconut drink. Le Binchotan's special supper is available until end Aug 2018. The cocktail is available from 6pm onwards and the food after 9.30pm.